Packing is a mandatory part of every house move. In case you want to use packing services NJ, which is the safest option, you don’t need to worry about this. However, if you choose to do it yourself, you could find our these packing tips useful. Compared to packing fragile items, packing your clothes is much less risky. Still, they can be easily damaged if packed poorly. If you don’t know how to pack your clothes or want it done perfectly, call the real pros. Why is proper packing important? Packing your clothes and all other items properly has several advantages. Firstly, the clothes will be easier to transport. Your residential movers NJ will appreciate this. Secondly, you can save space thus saving packing material. Thirdly, you reduce the risk of damaging your clothes. Moreover, by packing your clothes like a pro, you can significantly reduce moving costs. You probably, like most of us, have some clothes you do not wear. Forget about the old excuses like “maybe they will come back in style” or “I will lose/gain weight”. Do not give the clothes too much sentimental value. That is a very common mistake people make when deciding what to keep. Bring only the clothing you love and wear on a regular basis with a few special occasion and different climate items. What to do with the rest? First, there is selling. Take this great opportunity to make some money for the move. Then, there is recycling. Some retailers even offer discounts if you bring old clothes for recycling. The nicest thing to do would be donating clothes to one of many charity organizations. In conclusion, don’t throw anything away. Just like you should clean the entire house before moving, you should pack only clean, stain-free clothes. Use this opportunity to wash, dry and repair all those items that have been waiting for a while. If you pack things that are not ready to wear they will just end up in some corner again. The packing methods depend mainly on the distance. Unlike long-distance moves, local moves allow you to be a little less through when packing your clothes. After all, the items will not be traveling for a long time which lowers the risk of damage. 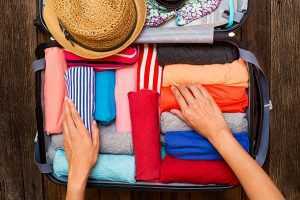 Roll your clothes into small bundles, just like you do when you pack your suitcase for a vacation. Shorts, pants, and jeans should be folded in half and then rolled. Before rolling tops, fold the body in half vertically, fold in the sleeves and then start rolling. Packing clothes for moving is not a task many people enjoy. You can make big bundles of clothes as well. Lay one larger item (like a jacket), then put a smaller item on top of it, then a smaller one on top of that one. In the end, wrap everything in the largest item creating a bundle. Put these bundles in a box making sure the lighter ones are on top of the heavier ones. When traveling across the country, store hanging clothes in closed boxes or garment racks inside a moving vehicle. When traveling a short distance, keep the hanging clothes on their hangers and wrap them in a plastic bag. This will save you a lot of packing and unpacking time. You can use a garbage bag of a suitable size. Tie the hangers together in groups of 5-15 for easier transportation. Clothes inside drawers can stay there, the drawer can be used as a box. Just make sure there is no empty space inside and disable the drawers from opening. Alternatively, you can close them and move the drawers separately. Clothes can be vacuum sealed in order to save space. If you plan to store them for a longer period of time, avoid vacuum bags because clothing needs air. Delicates such as silk and shoes should be packed separately so as to avoid damage. Use tissue paper to wrap delicates for additional protection. Softer fabrics, such as underwear, T-shirts, jeans, cotton, and knitwear resist wrinkles. So, you can roll them tightly. Stiffer fabrics, such as dressy pants, starched cotton shirts, blazers, and skirts demand careful folding. Folded items can go on top of the rolled ones. Put a dry cleaning bag between the layers of folded clothes. This way, the clothes will not stay in one place too long which means lines can’t form. Knowing the right packing techniques saves both space and money. Feel free to utilize clothing as cushioning when packing fragile items. Of course, you should use something older and cheaper, not your favorite pieces. Before packing your clothes, separate them by season and family member. Also before you start, prepare the boxes, bags, and markers you are going to use. Use smaller bags and boxes for clothes. Although they might seem like something that can be put in a large box, they are actually pretty heavy items. Pack off-season clothing first. These are the clothes you won’t be using soon. Pack the clothes you will need first last. Since unpacking can take ages, put aside a box with a few clothing items you will be using on the moving day and immediately after the move. This box should contain pajamas and underwear, too. Label all boxes clearly before loading the moving truck. This will make the unpacking much easier. When labeling boxes with clothes, instead of writing just “clothes”, add more information. For instance, “dad’s clothes”, “knitwear” or “summer clothes”. Make sure your clothes are protected from pests and moisture. In case you have any questions or doubts, ask your professional movers NJ for packing advice, including how to pack your clothes like a pro. How to avoid NJ moving scams?